So far this site has concentrated largely on local and national events, and their impact upon Weddington and its Castle. However, by the dawn of the twentieth century the world had become much more global, and it was to be events outside of the British Isles that would shape the lives of its inhabitants throughout this century. The first, and most brutal, example of this was to come in 1914, with the outbreak of the First World War. By 1914, through a series of alliances, Europe had formed itself into two huge opposing camps. On 28th June 1914 the heir to the Austro-Hungarian throne, Archduke Franz Ferdinand, was assassinated in Sarajevo by a young Bosnian named Gavrilo Princip. This led, on 28th July 1914, to war between Austria-Hungary and Serbia. Russia mobilized in support of Serbia. Germany declared war on Russia and then France. On 4th August 1914 when German troops crossed the Belgian frontier on their way to Paris, Britain declared war on Germany. The Germans were stopped about 30 miles from Paris and dug-in to form what would become known as the Western Front. A series of trenches ran from the Belgian coast to the Swiss mountains. There was no opportunity for either side to out-flank the other and the Allies were therefore forced into frontal assaults in their attempt to break through the German lines, suffering heavy losses and severe casualties as a result. The Allies attacked on the Somme (1916), Arras and Artois (1917) and Ypres (1917) to name just a few of the costly battles. The Germans attacked at Ypres (1915) and Verdun (1916). Although the Western Front was the main theatre of operations, British and Empire troops fought at Gallipoli (1915), Macedonia (1915-1918) and Palestine (1915-1918) to name but a few. With the introduction of unrestricted U-boat attacks in the Atlantic, America declared war on Germany in April 1917. Meanwhile, the war on the Eastern Front had left Russia on the brink of collapse and in December they signed an armistice. The Germans were now free to move their army from the Eastern Front to the Western Front, and in an attempt to end the war before American troops could arrive in sufficient numbers, they attacked on 21st March 1918. For several months the offensive pushed the Allies back, but in July the Germans were stopped at the Second Battle of the Marne. The Allied counter-offensive began in August and in what became known as the Last Hundred Days, they pushed the Germans back in the greatest series of victories in the British Army's history. Germany sought an armistice which came into effect at 11 a.m. on 11th November 1918. The war left more than 7,000,000 dead on the battlefields and a further 21,000,000 wounded. In Nuneaton alone 675 men died in war service. The First War World was to have its own, unique, impact upon Weddington Castle. Changes had already occurred a few years earlier, when, on the 3rd of August 1911 Henry Cunliffe Shawe died, leaving the Estate to his son, Henry Nigel Pole Shawe, who went to live in the Grove in 1912. It appears that Henry Shawe senior had been somewhat ill prior to his death, with the Tamworth Herald reporting a fall in the month prior to this. His obituary from the Herald on August 5th 1911 can be read here. A Captain Geoffrey J Shakerley is noted as living at the Castle from around 1912 until his death in 1915. In March 1916 one Edward Melly (seen on the far right of the picture to the left) secured the lease of Weddington Hall in order to establish a Red Cross Hospital for wounded soldiers in the building. He paid for much of the equipment needed to make the hospital operational, this on top of several other contributions he and his wife had already made to the war effort. Rooms on the first floor were converted into hospital wards and named after local industrial companies who contributed to their upkeep: “Griff”, “Arley”, “Hall and Phillips”, “Birch Coppice”, “Haunchwood” and “Stanleys” were names painted onto the doors of each ward. Weddington Hall Hospital opened its doors to patients in July 1916 with 55 beds. The only trained nurse was Sister Carrington who had come from Burton-on-Trent. The Commandant was Mrs Fowler, the widow of Colonel Herbert Fowler (a former Director of Arley Colliery) who died early on in the war. There were two Medical Officers, Dr Wolfendale and Dr Edward Nason. The bulk of the staff were 95 V.A.D. 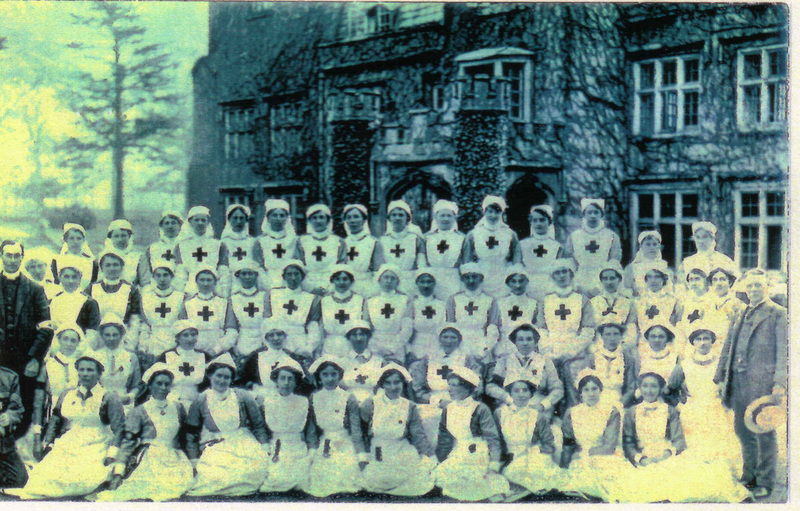 (Voluntary Aid Detachment) nurses from the Nuneaton and Hartshill detachment of the Red Cross. A few were married (nurses included Mrs Bowerman, Mrs Mander, Mrs Wilson and Annie Baxter) but the majority were single - the unmarried daughters of local families. In 1916 there were 42 patients. However, by 1918 there were 364 in-patients whose average stay was 48 days, and 60 out-patients each attending on an average of 10 times. Arbury Hall also functioned as a similar hospital with 12 beds, later increased to 20. Its Commandant was Mrs Newdigate and for a short time it had a trained nurse. Weddington Hall was for NCOs and Privates. "Many of the patients used to congregate by the drive gateway to chat with Sunday afternoon strollers"**. You can read a fascinating account of presentations made to nursing staff of the Weddington Castle Red Cross Hospital after the end of WW1. (Tamworth Herald - Saturday 14 June 1919) at this link (in the fifth column along). Mr Melly had a lifelong concern with hospitals, possibly linked to his father's cousin William Rathbone, who founded district nursing. He was involved in the creation of the Cottage Hospital in Manor Court Road, making donations and acting as Financial Secretary. He also paid for much of the Weddington hospital equipment - largely through his managership of the nearby Griff Colliery. 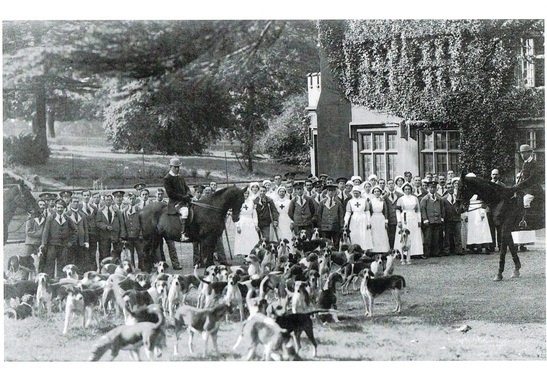 This development was also linked to the Castle's direct ownership; for Mrs Shawe was Vice-President of the Nuneaton Branch of the Red Cross, and the Reverend Bracebridge Hall was Volunteer Aid Detachment Commandant. Sadly, and ironically, Mr Melly died aged 83, along with his wife, in the World War II Nuneaton Blitz of 17th May 1941 which obliterated their Church Street home. Aside from the war, in 1916 a stained glass window dedicated to Henry Cunliffe Shawe was placed in St. James' Church. The following year marked the beginning of the end of the Weddington Castle and Estate, with H.N.P. Shawe starting to sell off the Castle's surrounding lands and farms. In 1917 he sold Lower Farm (acreage: 87a 2r 22p) to Charles Mills, a farmer from Leicestershire for £2,850. A year later, the Great War over, the Red Cross withdrew from the Castle. * detail above on Weddington Hall as a Red Cross Hospital adapted from "Nuneaton Hospitals: The First Hundred Years" by Jennifer Burton and John Bland.